With Raven's WYSIWYG Reports tool, you can create a custom, interactive HTML report in a matter of minutes. Just follow these steps to create your first report, using data from your Campaign. Before you do anything, you'll need to create your report. To do this, navigate to Reports > WYSIWYG Reports and click the New Report button. This will create a blank slate for you to work with. We'll add data to that report momentarily. If you've already created a report that you would like to duplicate, you can use the Import Template button to copy an older report's sections and widgets into your newly created report. Otherwise, you'll want to start from the beginning. Click the Add Section button to bring up the Section picker. Choose a Section from the menu. Every tool in Raven is represented here, along with options for customizable text summaries, file attachments and imported data. In the Section, choose a group of widgets. These are preset arrangements of KPIs, graphs and tables that approximate the reporting modules from Report Wizard. Let the new Section populate and repeat as desired. You can add as many Sections as you'd like to a report. To delete a section, hover over the Section title to reveal option icons. Click the X to delete the Section. You can also rename the section by clicking the gear icon and change the date range by clicking the calendar icon. Choose a Section from the menu. Be sure to pick the tool that contains the data you want in your custom widget. Instead of choosing a widget group, click the Create Custom Widget button. Select a metric from the dropdown menu and then select a Widget Type: KPI, Line Graph, Bar Chart, Pie Chart or Table. Choose your options. The options here are dependent on the kind of metric that you've chosen. Google Analytics widgets, for example, will give options for Advanced Segments and Primary Dimensions. Give your Widget a name and assign it to a Section. You'll be able to preview what your custom widget looks like at the bottom of the Add New Widget window. To edit your Widget, hover over it and click the gear icon. To delete the widget, hover over it and click the X icon. If you want to add multiple widgets with similar settings, click the Add Another Widget button to keep the edit screen visible while adding your widget to your report. Once you've created your report, you can brand that report with your logo. Click the Add Logo button to select a previously uploaded logo or add a new one to the report. If a logo is not chosen, this space will be blank in your report. Finished with your report? Click the Publishing Options button and select the Publish Report option to make it live. Kick back and we'll compile all of that data into an easily sharable report. Don't like what you see? Click the Unpublish Report option in that same menu to take it offline. Don't forget! If you make changes to your report, you must publish the changes to see it in the HTML or PDF version. Click the Submit button to save your Report Settings. Report Type: Either let the report run whenever you choose to publish new changes, or set it to automatically run on a schedule. Date Range: Set the overall date range for your report sections. This can be a custom range, or one of our preset date ranges. Selecting the "Change all section dates to this date range" will automatically change all of your sections to fit this range. Compare Date Range: Similar to the Date Range setting, but for the range of dates that you'd like to compare against. Selecting the "Change all section dates to this date range" will automatically change all of your sections' comparison ranges to fit this range. Each of these settings affects the entire report, so be careful! 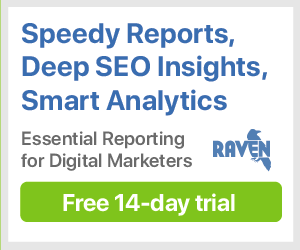 When you publish your report, Raven will automatically convert any preset date ranges — Last Month or Last 30 Days, for example — to Custom Date Ranges. This conversion occurs to ensure that the data that you want published stays in the ranges that you picked. If you're finding yourself reporting regularly on changing date ranges, we recommend creating a scheduled report.